The long transatlantic ferry flight of this aircraft ended in tragedy for its crew when it crashed into the slopes of Mount Truskmore in north Sligo on the foggy afternoon of December 9th, 1943. Three young members of the United States Army Air Forces lost their lives as a result and the seven survivors faced many months of recovery in most cases. The story is told in the Adobe PDF format file linked to in the box below. It tells the story of the ten men who flew 42-31420 on her last flight and the tales of the local people in the area of the crash. On the afternoon of 9th December, 1943, the peaceful slopes above Ballintrillick in County Sligo would be shattered by the crash of an American bomber. The aircraft, a Boeing B-17G-15-BO Flying Fortress was being flown on a ferry flight from Goose Bay to Prestwick in Scotland. The aircraft was part of the fourth batch of G model B-17's produced by Boeing and the new sub type was only in the process of being issued to combat units in England and the Mediterranean in late 1943. Among other improvements, the most noticeable new feature of the B-17G was the introduction of a defensive machine gun turret on the underside of the aircraft's nose, the remote controlled chin turret. On board the aircraft that afternoon were ten young airmen of the United States Army Air Forces (USAAF). Following the crash, the pilots’ 2/Lt.’s Walch and Grim walked down the mountain to seek help. 2/Lt’s Fox and Wallace were to die in the crash of the aircraft while Sgt. Latecki would succumb to his injuries four days later in hospital. The surviving crew men suffered serious injuries. Local people from the homes below the mountain hurried to the crash to provide assistance to the aircraft crew, being joined later by personnel from nearby Irish Army barracks. After many hours of struggling the six injured men were removed down the mountain and brought to Sligo County Hospital. All survivors were later taken across to Northern Ireland. Robert A Smith records that he finished his training at Kearney Army Air Field in Nebraska. This was in late 1943 a base with processing units where B-17's and their crews were prepared for ferrying to the European theatre of operations. It is noted below that crew members Emil C Drake and Adam J Latecki are recorded as being a members of a training squadron at that base. The crew would have gathered at Kearney to complete training as a crew having each completed their individual training courses and there began the flight to Newfoundland and the ill fated flight to Europe. 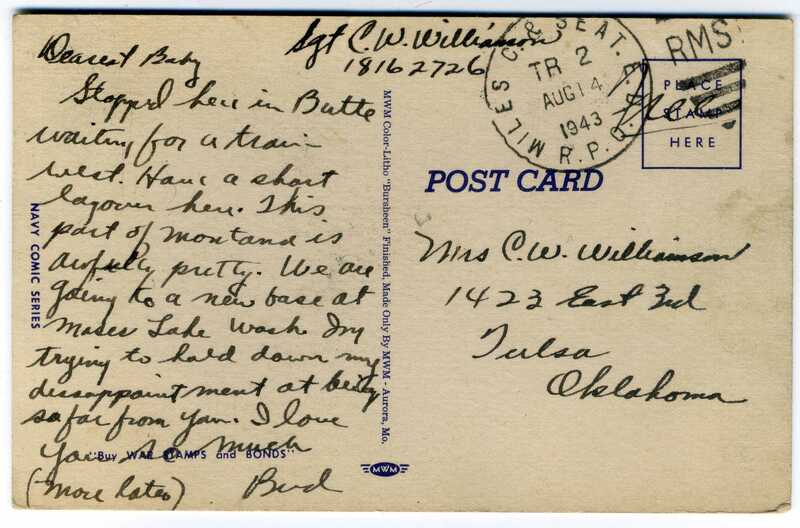 Carl W Williamson in a postcard to his wife stated that he was enroute to Moses Lake in Washington in August 1943. The crew may have been placed together at this base, home of the 396th Bomb Group (Heavy) which was a replacement training unit for B-17 crews at that time. The following biographies discuss the ten members of the crew. 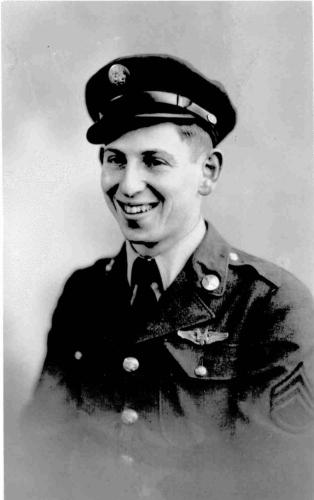 Richard Clemens Walch enlisted in the USAAF in March 1942. Coming from Hennepin County, Minnesota, Richard passed away in September 1987 in Hopkins, Minnesota. He is buried in Fort Snelling National cemetery in South Minneapolis. Ricard's older brother, 1st/Lt Henry H Walch, was killed on 25 February 1945 when the B-26 Marauder bomber he was crew member on crashed with another bomber from the 587th Bomber Squadron, 394th Bomber Group, Medium. He was initially interred in France but in 1948 his remains were returned to Minnesota. Their sister Jane served in the US Navy WAVES during the war. Richard's son, Richard H Walch, like his father served in the US Armed Forces but was sadly killed in a training accident in November 1990. Richard is fondly remembered by his daughters Barbara and Susan, his grand-daughter Kari as well as his many grand children. 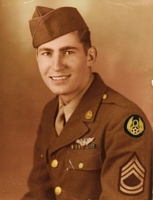 Enlisting in March 1942, William Grim came from Greensburg, Pennslyvania. William married his sweetheart Ethel in February 1945 and the Daily Courier again carried a large article describing their candlelit ceremony. William Grim remained in the Air Force after the war finally retiring in 1970. He passed away in Texas in 1994. He left behind a report which he prepared in conjunction with Moss Mendoza and this has been transcribed by his daughter Gretchen and is presented after this list of names. In the US NARA archives, a copy of a transcription of the events 2/Lt Grim exists. It reports that it was he and 2/Lt Walch that went down the mountain from the crash site to seek help. The hand writing of the intelligence officer sadly makes it difficult to read the report, expected to date from mid May 1944. Spelling is as presented in the report. 24 hours in Irish Hospital in Sligo. From there moved to the 28th Station Hospital (near ENNISKILN) There 24 hrs. Kingscliff, Edinburgh and Glasgow of course are all places in Scotland. 79th General Hospital had been set up at Waringfield Hospital in November 1943. This was located in Moira, in County Down in Northern Ireland. Son of Oscar and Alma Fox of Fort Wayne, Indiana. Richard was born in April 1919 and enlisted in the armed forces in November 1941. His remains were initially buried in the US Plot of Brookwood cemetery in Surrey, England but were returned to Indiana after the war. 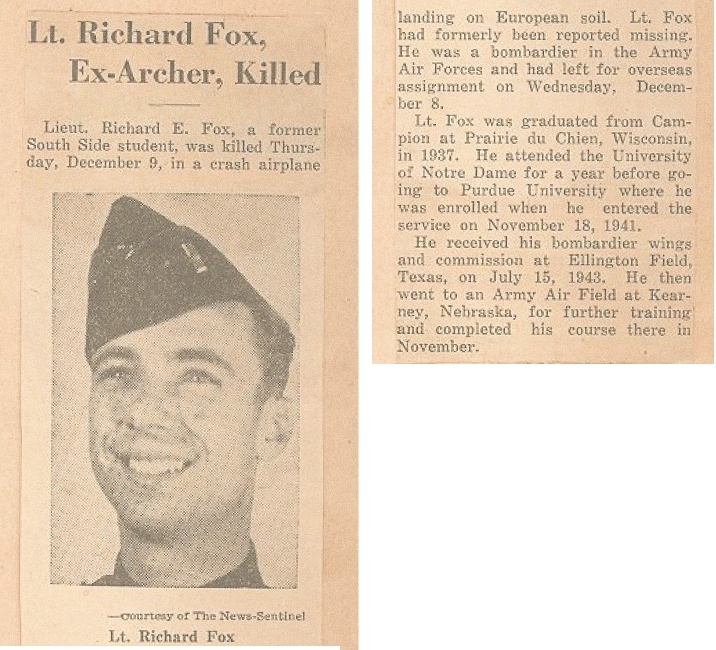 A photograph and obituary for Richard E fox received from his niece Trish. Richards remains were returned to his native Indiana in 1948 and interred in the family plot in the Fort Wayne Catholic Cemetery. Son of Daniel and Katherine Wallace of Hoboken New Jersey. William F Wallace entered the service from Hudson County, New Jersey. Tragically the family would loose three sons to the war, William's brothers Daniel J and James M both died in air accidents with the US Navy. The three brothers name's appear at the bottom of the Hoboken War Memorial. The local Wallace Primary School is named in their honour. Both his brothers died before William. Their father, Daniel Wallace, died in 1948 leaving instruction that his son William was to remain buried overseas so as not to disturb his remains. They were survived by Williams sister Catherine only and their aunts, uncles and cousins. Catherine died in 1987 having lived in care all her life, having been born it appears with special needs. 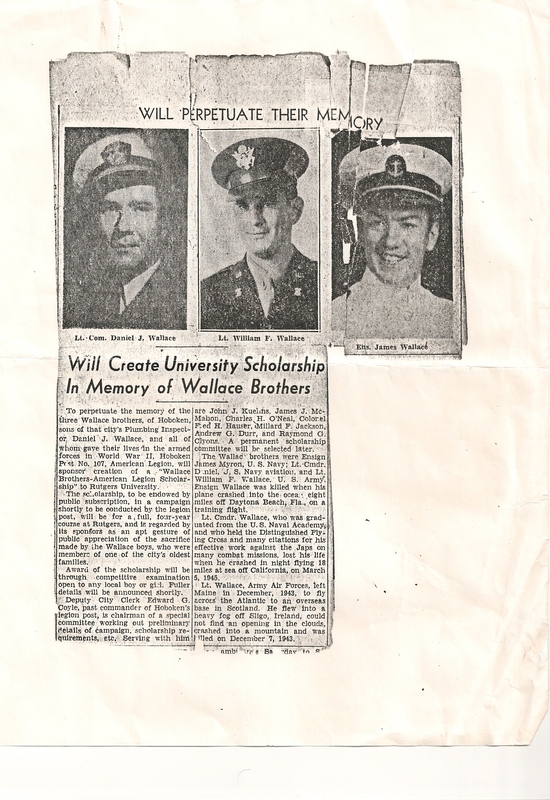 The New York Times of April 7, 1943 carried a story relating that a James M Wallace of Hoboken, New Jersey was feared killed in a Naval aircraft crash. It reported that he had two brothers as mentioned above and that his father, Daniel Wallace was Plumbing Commissioner for the City. They lived at Bloomfield Street, Hoboken, the same address they can be found at in the 1930 census. Their cousin, a William Goode, remembered them on the World War Two Memorial Website. Their cousin Patty LaSorsa very kindly provided the photograph of William. This collection of information about 2/Lt. Wallace is built up using ABMC information above and his Individual Deceased Persons File from the US Army Archives. The only William F Wallace enlistment to fit the ABMC data and the NARA information is for William F Wallace born in 1918 and enlisted in August 1941. The family were able to provide the following newspaper cutting. And their fathers obituary from 1948. 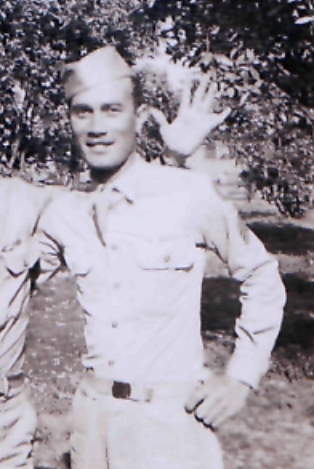 Moss L Mendoza enlisted in the Air Force in October 1942 in Boston. He was born in 1923, son of Florence and Judah Mendoza, and sadly passed away in Florida in 2002. He is remembered fondly by his daughter Roberta and his brother Jack, who also flew during the war with the US Navy. Moss was seriously injured in the crash. 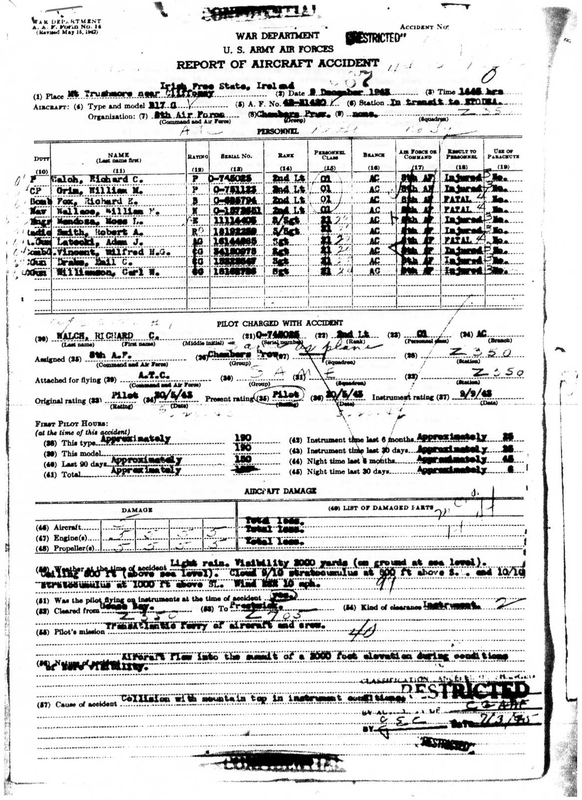 Shipping records show that he arrived back in New York on December 18, 1945, sailing on the Queen Mary. His name is recorded in error on the manifest as Maurice but the serial number is his. His military occupation is given as Air Gunner. He sailed home attached to the personnel of Army Air Force Station 595 at Troston, Suffolk, England. 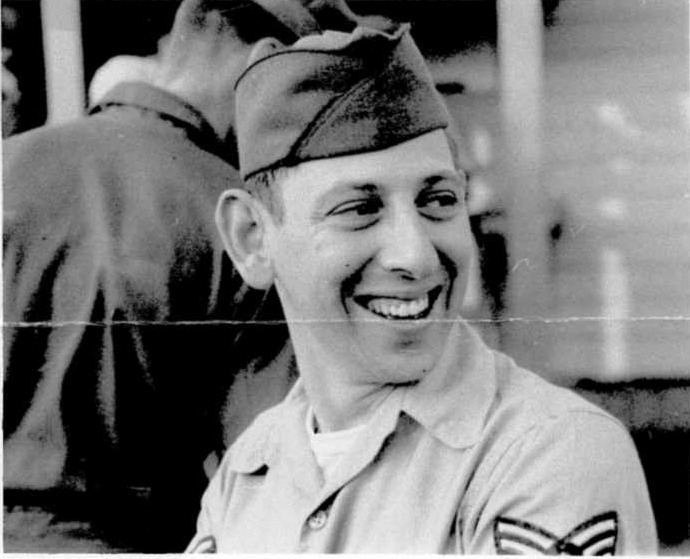 The above photo from Moss’s albums was taken post war while serving with the Air Force Reserve at Otis Air Force Base in Massachusetts. Robert A Smith, or Bob Smith, recovered from his injuries received in the Sligo crash and would go on to see action over Europe with the 527th Bomb Squadron of the 379th Bomb Group. Robert A Smith contacted me in January 2006 through the assistance of the 379th Bomb Group Association. Bob lives in Washington and was interviewed by local radio in Northern Ireland during that year. “Worst trip on June 25, 1944 much flak and fighters. Was in A/C 890 (listed in Shades of Kimbolton). Bombed bridge at Suryonne, France. On the way back we took a direct hit, which took off chin turret. Two in-board engines out and severe vibration. Bombardier Lt. Maatta Arthur was killed. Co-Pilot Lt. Pat Rawls said, all that can, better bail out, so Navigator, Lt. Robert Evans (Tail Gunner), S/Sgt. Joe Simoncini and (Waist Gunner), S/Sgt Francis Phillips all jumped, but were shot on way down and killed according to Major Alec Andrews, who was observer on that trip. 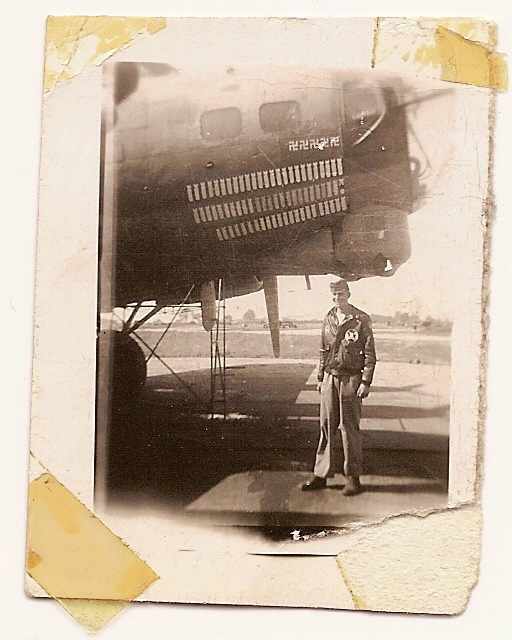 Bob and his son in law Donald Schulz were kind enough to send this photo, above, showing the damage suffered by his aircraft, B-17 42-97890, painted with nose art, Lil' Satan on June 25th 1944. 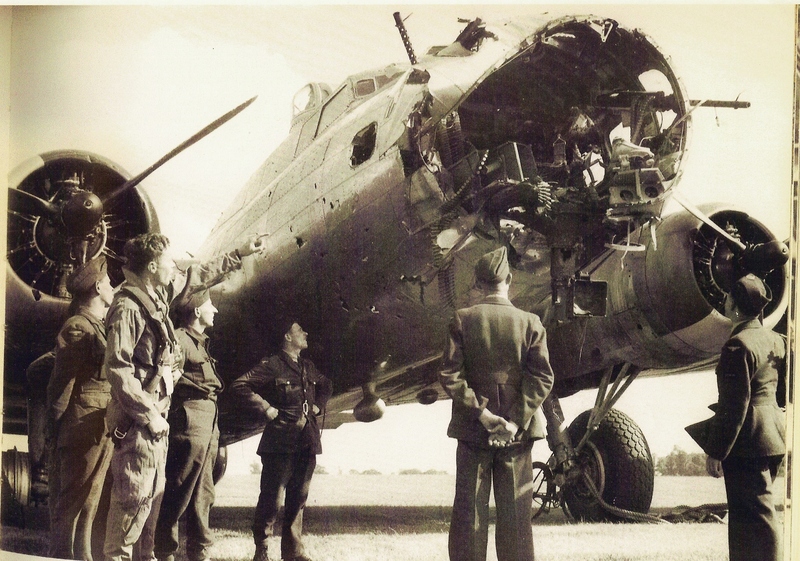 Bob is shown above standing below another of the aircraft he flew and fought on, Carol Dawn. A local Sligo man, Sean Gallagher, was 7 years old at the time of the crash. Bob tells how that in 1959 Sean went up to the crash sight when he was visiting relatives. He lived in Brooklyn, New York in 1959. He found Bob's dog tag at the crash site in 1959. Somehow he got Bob's home address in 1943 and sent the tag and letter to him there. Bob had moved to Washington then so it sat in the 'dead letter office' for a time until someone recognized Bob's name and got it mailed to him in Washington. Bob last met a crew member, Richard Walch, at Bob's wedding in 1947 in Minneapolis. He is the proud father of six children and 26 grandchildren. 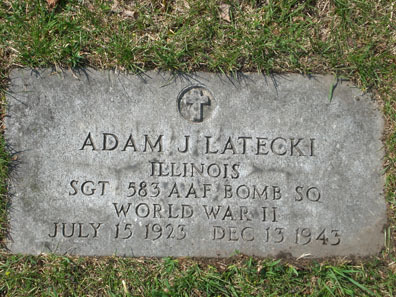 Adam J Latecki enlisted in October 1942 in Chicago. Born in July 1923, he was son of Stephen and Mary Latecki of Chicago, both of whom were immigrants from Russia and Poland. Adam's father was a tailor and died in January 1931. 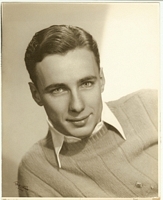 His mother remarried in 1937 and in 1943 was Mary Stopa, Adam's step father being Philip Stopa. Adam had one sister born in 1930 named Mary but she has since passed away in 1987. Sgt. Latecki survived the crash but died from his injuries on December 13th at the 28th Station Hospital at Irvinestown in Northern Ireland. Janice Colvin of Chicago, kindly provided this photo of his headstone in April 2010. Wilfred Vincent enlisted in Mississippi in September 1941. Born in late in 1917, he passed away in April 1998 and is buried in Biloxi National Cemetery alongside his wife Wilhelmina. He was at the time of his death resident in Ocean Springs, Mississippi. He was the adopted son of Hattie and Wilford L Ganier, Baton Rouge. Shipping records seem to show him flying from New York to Prestwick Scotland on 10 May 1944 as a passenger on a USAAF transport aircraft. It is more likely the manifest form has the destination and embarkation points mixed up as the records relate only to arrivals in New York. He was discharged from military service following the crash, due the nature and extent of his injuries. He returned to his home after the war and and opened a tile-setting business, which he ran for many years until his retirement. His family recall that he tried for many years to contact his former crew mate and may have contacted one who lived in Florida. He was under the impression that seven of them had died in the accident. The 583rd Heavy Bomber Squadron, one of the Squadrons in the 393rd Bomb Group, a Replacement Training Unit, was located at Sioux City Army Air Base in Iowa from November 7, 1943 to April 1, 1944. 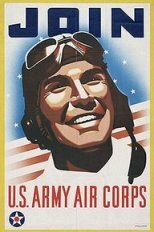 The unit was not sent to a combat theatre but was based at Kearney Army Air Forces Field between August and November 1943. Emil enlisted in the Army on 23 September 1942 in Louisville, Kentucky. The Northwest Arkansas Times in 1943 – 1944 recorded some of Emil’s recovery from injury. The paper on December 14, 1943 reported that his mother had received word on Friday December 10th from the C/O of the North Atlantic Wing at Presque Isle that her son was missing. By December 22nd she had been informed that he was in fact seriously injured. Further on the 26th January it was reported that Emil was somewhere in Ireland undergoing treatment. Some months later on 2nd June they reported that he had been transferred to a New York hospital for further treatment. On October 3rd, 1944, the paper reports that ‘Mrs Nan Drake has had as her guest from the Army-Navy hospital in Hot Springs her son, Sgt Stanley Drake’. It is thought that this refers to Emil. Tennessee's death toll resulting from winter's first prolonged blast at the Southland rose to four Monday night when a car and a Greyhound bus collided near Rutherford, Tenn. Highway patrolmen said Mrs. Mamie Drake and her son. Emil Drake of Evanston. Ill., were killed in the wreck. The icy road, Highway 45-W, was blamed for the collision. Word has been received here by Mrs. Ella Fletcher and Mrs. Betty Searcy of the death of Mrs. Nan Drake and her son, Emil Drake. The two were killed in an accident while enroute to Evansville, Ind., where they were residing. The bodies are being returned to Searcy for burial. Mrs. Drake was a cousin of Mrs. Betty Searcy of Springdale and a niece of the late J. H. Fletcher of Springdale. She spent some time in Springdale while her son was recovering from an airplane accident in which he was seriously injured during the war. A transcription of his death registration on the familysearch.org website lists his parents names as ‘Columus’ Drake and Mary E Fletcher. Further research suggests Emil’s father was a member of the US Army in early part of the century and may have signed on with the Canadian Army during WW1. NO further trace of Columbus Drake has been found by this research. 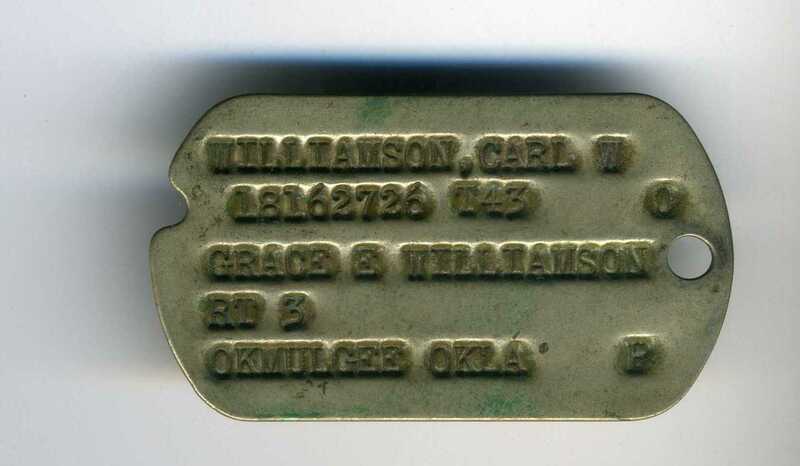 Carl W Williamson came from Okmulgee, Oklahoma, son of Barnett and Emily Williamson. Born in 1909, he enlisted in the air force in November 1942. His son in law, Billy J Wells Sr and his daughter in law Marilyn Wells were very helpful in this research by sending to me items belonging to Carl from his war time service. Bud, as he was known by all, was an all star football player for the Okmulgee Bulldogs. He attended college at Oklahoma A & M in Shawnee on a partial scholarship where he played both football and baseball. When he came home from college, he played baseball for Phillips Petroleum Company and was later hired at the refinery. He then went into the service. “My first meeting with Sgt Williamson was in 1944 at a military hospital in McKinney, Texas. My wife, Huberta Wells, and I were on leave from NAS Whidbey Island, Washington. Bud was in hospital bed with his leg elevated to help relieve the swelling. Huberta and I had spent 3 nights and 4 days on a steam train (cold and dirty) travelling back to Texas where we were joined by Madalyn, Buds wife and Huberta’s mother. Bud was allowed to get out of bed where he joined me in a visiting room at the hospital. I asked him what had happened. He said the weather was very bad before the crash but I also got the impression that he never knew they were about to hit a mountain. I remember that Bud and I sat on the patio talking about our service experiences. He talked about the plane crew but again that was a long time ago. Bud enjoyed fishing, bowling and gardening as well as woodworking. Not surprisingly he excelled at all of that. Shipping records show that Carl landed in New York as a passenger on a military transport aircraft in May 1944. He spent the rest of the war recovering from his injuries, returning home in November 1945. His family still have his 1945 train tickets. Carl passed away in 1987, his obituary from the Okmulgee Daily Times read: CARL WILLIAMSON Carl William (Bud) Williamson, age 77, died in a local hospital on Monday, January 5, (1987) after a long illness. 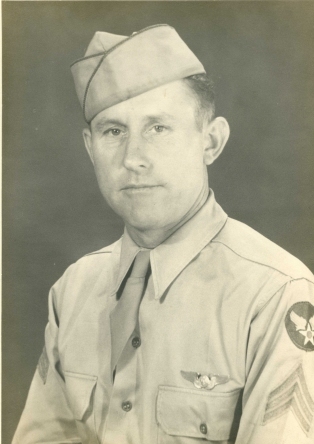 Born January 26, 1909 in Okmulgee, Mr. Williamson was a veteran of the U.S. Army Air Corps. He was a member of the First Christian Church, the Scottish Rite of the McAlester Consistry, and was a 32nd Degree Mason in the Knights of Templar. Survivors include his wife, Madalyn Williamson of the home in Okmulgee; one daughter, Huberta Wells of Corpus Christi, Texas; two sisters Nina Bailie of Okmulgee, and Peg Mason of San Diego, California; two grandchildren, and two great-grandchildren. Items belonging to Carl ‘Bud’ Williamson which his family shared with me. These items are presented here both to remember Carl but also as they are relevant to all crew members. It can be imagined that their loved ones, parents, wives received such telegrams and postcards. Carl’s service ribbons. 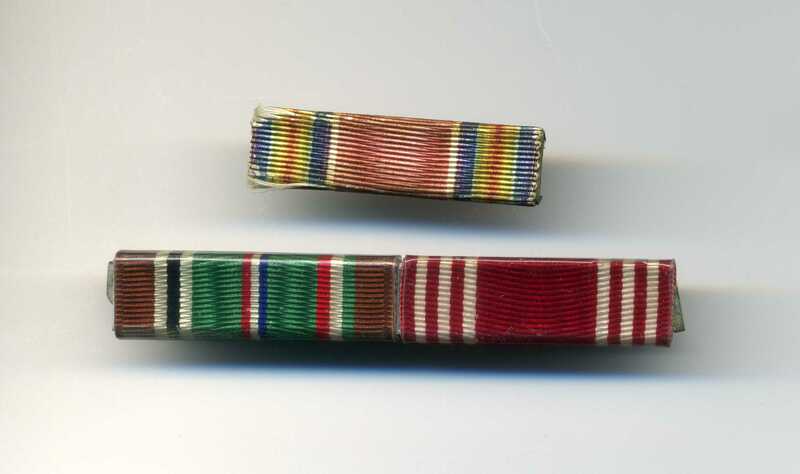 The upper is the World War II Victory ribbon, the lower arrangement is the European-Africa- Middle Eastern ribbon next too his red and white Good Conduct Ribbon. Carl’s Army Air Forces Aircrew Badge. 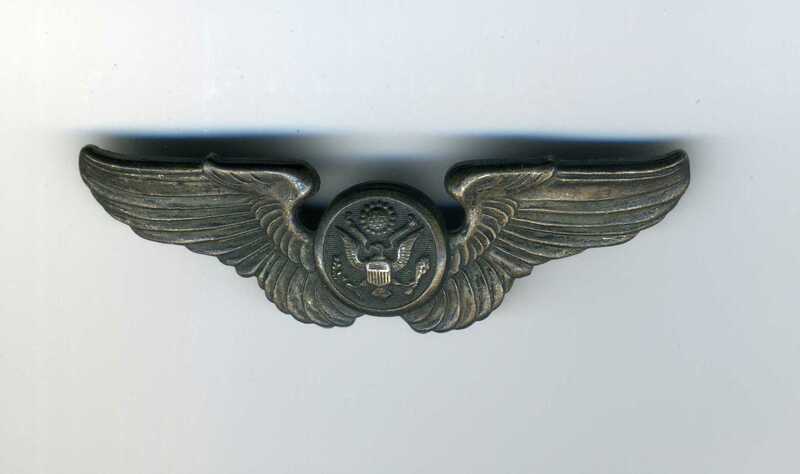 All aircrew members were authorized to wear this badge upon completion of training. Below, copies of the telegrams received by Madalyn Williamson in the days after the crash of 42-31420 in Ireland. 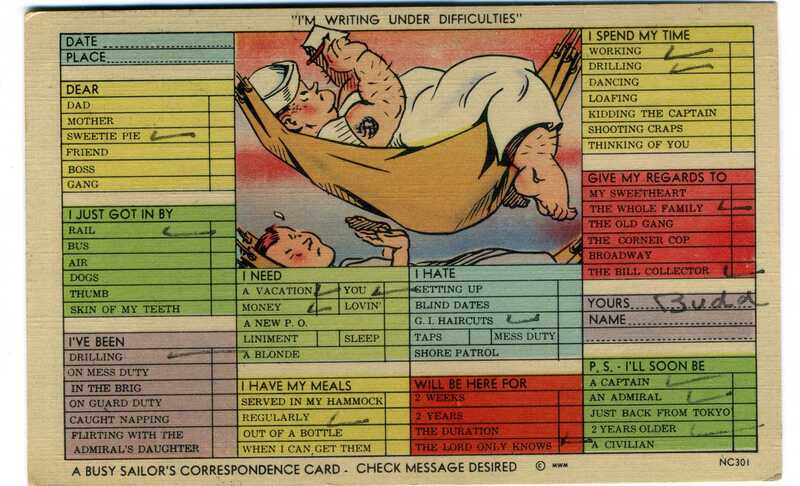 And a novel postcard sent by Carl to his wife in 1943 during his training in the United States. Dear Baby, stopped here in Butte waiting for a train west. Have a short layout here, This part of Montana is awfully pretty. We are going to a new bases at Moses Lake Wash. I’m trying to hold down my disappointment at being so far away from you. I love you so much, (more later) Bud. The following is a transcription of the crash report held by the Air Force Historical Support Office at Maxwell AFB. The quality of the image from microfilm is very poor so I cannot be certain of certain words in the report. Where I am unsure of words, I have underlined them in the text below. Plane was approaching Ireland at 11,000 feet, homing on the Derrynacross beacon. Course had been changed 5 degrees only, from the navigators set courses, indicating that aircraft was approximately on course. Nutt's Corner operations confirm that the first call from the aircraft (GAZA KING) was at 1346 ZED time, requesting QDM. At 1350 aircraft called again and told Nutt's Corner (RASAK ?) that he was at 9000 abd descending through overcast, and requested clearance to Prestwick (BURTON). At 1358 ZED time, Nutt's Corner cleared the aircraft to Prestwick (BURTON) at 4000 feet and the aircraft acknowledged. At 1426 Zed time, GAZA KING came on again to Nutt's Corner and requested a QDM, but it took until 1440 for Nutt's Corner to to get a good signal, at which time the gave the aircraft a QDM of 123 (third class). 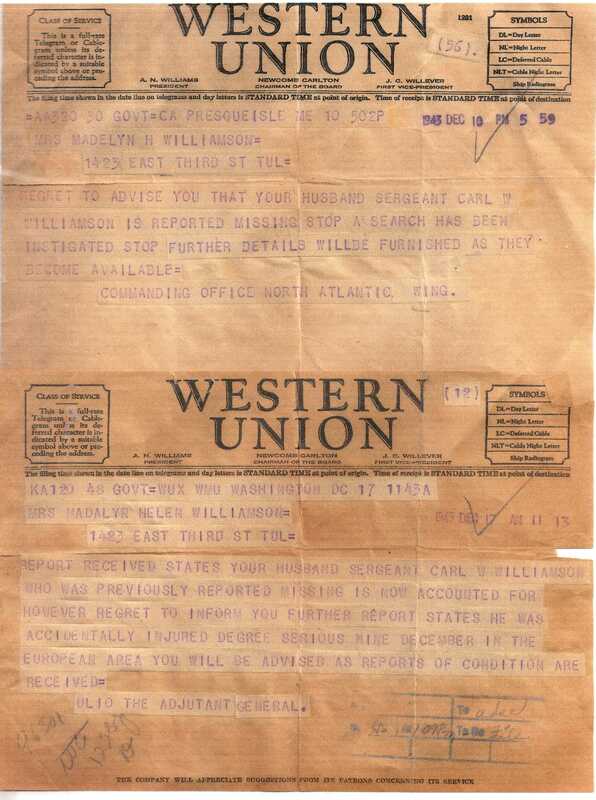 The log of Nutt's Corner does not show that this QDM was acknowledged by the aircraft, but Lt. Walch, pilot, states he got it and acknowledged it. The last actual call from the ship to Nutt's Corner was at 1433, while taking another bearing on the ship. The navigator, in the mean time had given the pilot an ETA on the Irish coast of approximately 1355 (which was 30 minutes before the ship actually hit). All other aircraft flying the same course at the same time encountered from one hour and thirty minutes to two hours and 15 minutes delay in reaching their ETA on time, as the wind forecast for the zone was Approximately 15 to 20 MPH at 270 degrees, as against the actual conditions of winds varying from 20 to 25 MPH at 90 to 180 degrees, varying with altitude. Pilot started gradual descent when the ETA came up and passed. Hoping to break through the overcast, pilot kept descending until altimeter indicated between 2?00 and 2?00 feet, Navigator (who had been supplying pilot with some forecast throughout flight) prior to final let down, indicated to pilot that maximum altitude of obstructions would be about 2100? feet, it was estimated that they had a fairly good line of position, upon letting down, still steering 125 magnetic. At this point there was some concern about the gasoline reserve, on the part of the pilot, and due to the passage of time of the ETA on the Irish coast he decided to land at Nutt's Corner, rather than go on through to Prestwick. Although the fuel gauges indicated that he had 500 gallons of gas left, Lt. Walch (pilot) stated that he had little confidence in the accuracy of the fuel gauges. Finally, immediately prior to the accident, pilot levelled off slightly below 2000 feet indicated on his altimeter, at which moment the Co-pilot sighted ground below, through a break in the cloud, and called the pilots attention to it. Lt. Walch states the last thing he remembers is reaching for the up elevator knob of the automatic pilot to start climbing when the crash came. At the time of the accident and immediately prior to, aircraft was not marking any radio ranges. It was further stated by Lt. Walch that at no time had the aircraft done any 'milling around' or changed course radically, even to the point of making a turn of more than 5 or 7 degrees. A take off was made at Goose Bay prior to the start of this flight, but due to some trouble with the fluxgate compass, the aircraft returned to Goose Bay to check it and refuel, involving a loss of time of about 2 hours for refueling and checking the compass. No new weather was received during this return to Goose Bay. Approximate location of accident is 6 3/4 miles true azimuth 143 degrees from Mullaghmore Head (Darby Hole) on Donegal Bay, western coast of Ireland. 2000 yards true azimuth 20 degrees from the summit of Truskmore. 5 9/10 miles true azimuth from town of Bundoran 211 degrees. 3 miles 100 degrees true azimuth from Ballaghnatrillick crossroads. Approximately 54 degrees 23 minutes and 45 seconds North Latitude, and 8 Degrees 22 minutes East longitude. The board believes that the accident was actually caused by error in judgment on the part of the pilot in descending below 4000 feet. The board would like to point out that the pilot was notified to proceed to Prestwick at 4000 feet and acknowledgement was received at Nutt's Corner. Further, the briefing manual covering entry into the United Kingdom over the North Atlantic route requires that under instrument conditions, approach will be made at 5000 feet, and the plane will remain at 5000 feet until directed to change altitude. If altitude had been maintained no difficulties would have been encountered. The board would like to recommend that minimum altitude be stressed to crews during briefing, to obviate such accidents. Pilots altimeter must have been in error somewhat, which cannot be explained but the fact remains that if airplane had remained at 4000 feet there have been adequate clearance over the mountains. Radio Call signs for Prestwick, Nutt's Corner and the aircraft are the words in brackets in the text above. Nutt's Corner call sign needs to be confirmed. Times in the initial text are in GMT or Zed, Zulu time. William M Grim's daughter Gretchen was able to pass on this transcription of a report her father left of the crash which he prepared for Moss Mendoza. overcast and requested clearance to Prestwich. At 1358, Nutt’s Corner cleared the aircraft to Prestwich at 4,000 feet, and the aircraft acknowledged. The navigator had given an estimate to the Irish coast of 1355, but arrival over the coast was not until 1425. All other aircraft flying the same route were from 30 minutes to 2 hours later than their estimate doe to wind. At 1426, GAZA King requested a QDM, but it was 1440 before Nutt’s Corner got a good radio signal and game the aircraft a QDM of 123 (third class). They continued their descent, steering 123 magnetic. The crew reported they would land at Nutt’s Corner rather than continue to Prestwich due to low fuel and the distance remaining. The copilot reported sighting the ground through a break in the clouds. Shortly thereafter, the aircraft impacted the summit of a 2,000-foot mountain top. Crash location was 6-3/4 miles and 143 degrees from Mullaghmore Head (Darby Hole) on Donegal Bay, western coast of Ireland (also described as true azimuth of 20 degrees and 2,000 yards from the summit of Mt. Trushmore).The aircraft was destroyed, but Lieutenant Walch and six of his crew survived with some injuries, while Second Lieutenant Fox, the bombardier, and Second Lieutenant Wallace, the navigator, received fatal injuries. Subject: To the best of my knowledge, these are the events leading up to, during and after our B-17G aircraft impacted a mountain in Southern Ireland on 9 December 1943. 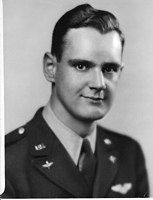 I, William M. Grim, 2nd Lt., Army Air Corps, was on 9 Dec. 1943, copilot of a B-17G, serial number 42-31420, for a transatlantic ferry mission to Prestwich, Scotland. We encountered unexpected strong headwinds en route to a point that fuel consumption became a matter of grave concern. We also encountered unexpected heavy cloud cover upon reaching the coast of southern Ireland. These developments resulted in a decision to make an intermediate landing for refueling at Nutt’s Corner, Northern Ireland. As we proceeded on course, visibility became zero; and during descent to gain a minimal visual ground reference into Nutt’s Corner, we impacted the summit of a 2,000-ft. mountain approximately 6-1/2 miles from Mullaghmore Head (Darby Hole) on Donegal Bay. I gained consciousness on the ground on the port side of the aircraft. When I was able to get up, I noticed that the navigator and bombardier were also on the ground and both appeared to have had fatal injuries. I then made my way to the plan to inspect the damage. It appeared that everybody I could see was down and injured. I particularly remember S/Sgt. Moss Mendoza (engineer) on the floor of the radio room in a very awkward position and asking for help. He had what appeared to be a serious head injury. The impact had tossed him from his regular station (starboard side) across the plane to the radio operations post (port side) with a force that resulted in his left leg breaking through the bulkhead. When I tried to help him, I discovered that both of my arms were broken and I was unable to assist. At this time, Lt. Walch, pilot, came in from the cockpit area. He was very disoriented and appeared to have a serious head injury. The need for help was obvious. Lt. Walch and myself, the only surviving crew members who were somewhat ambulatory, headed down the mountain to seek assistance. 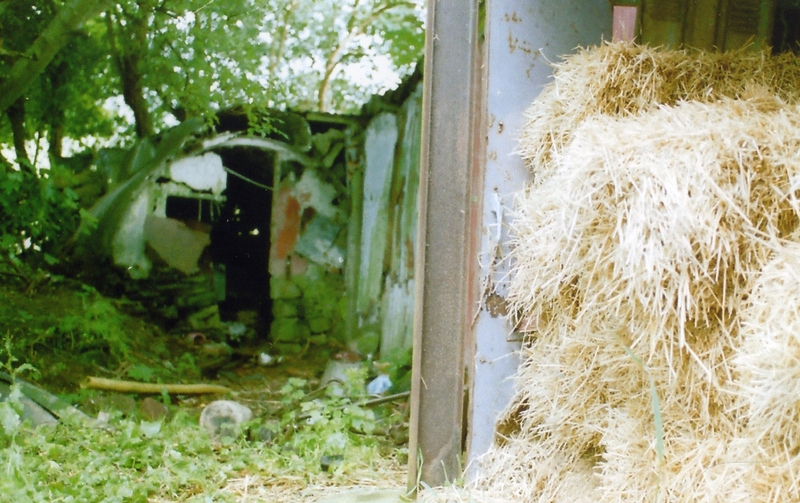 Local memories of those from Ballintrillick and surrounding area. Dan Gilroy, who was 90 in 2008, recalled the terrible weather the day of the crash. Dan was a miner in the barytes mines in the Gleniff valley at the time of the crash. During the week he was on the night shift at the mines and thus was not involved in the immediate relief efforts. He remembered knowing that the household of the Rooney's had helped out during the rescue effort by giving blankets. He also knew Doctor Evelyn Connolly later Dr. Connolly-Flanagan of Colloony, Sligo. He remembers her as a very good doctor. Paddy Rooney, now living in Drumcliffe, but who an 11 year old school boy at the time remembers hearing an aircraft flying very low as he came home from school that day. He and his family lived at the cross roads at the eastern end of the Gleniff Horse Shoe road across from Davies pub and shop. He remembers seeing all the activity of army trucks and ambulances that evening. The noise and lights were fantastic he recalls. The village he points out at that time was not connected to electricity so the activity was all the more noticeable. He can remember seeing vehicles with white stars painted on the doors. Bartly Rooney, no relation to Paddy above, tells a story also told by Paddy. Both their fathers traveled to the mountain that night to help in the rescue. One member of the crew was trapped by the aircraft and the ground. The men struggled all night to dig away the peat and earth from below to allow him to be released. Paddy Rooney recalls being told that it was local farmer Andrew Gilmartin who first met with survivors of the crash. He met two men in military uniform on the mountain side while out on his land. “As I mentioned I was 5+ years old then but still have good recollections of the crash. We lived on the flight path of the aircraft been ferried in from Newfoundland and can still remember formations of aircraft coming in across Donegal Bay so low we could see the stars on the underside of the wings. On the night in question I was of course in bed and one of our neighbours knocked and told my father ( James Rooney, Keelogues) about the crash on the mountain . My father dressed and left with my neighbor to go to the rescue with all the other local people. During the following days my mother went with myself and my brother Dan to my grandparents home to help making the famous tea etc., I also climbed the mountain to the site ; The plane was largely intact. The props had cut four furrows in the boggy mountain top for about 3-500 yards and came to rest in a large shallow dry boghole on its belly. Some of the engines were strewn along the four furrows at intervals but as I said, other than losing the engines it was largely intact. It landed right on top of the mountain which is relatively flat, were they were flying 10 feet lower they would have crashed into the mountain face - 10 feet higher and they would have missed it. A sentry on duty (American I think) gave me a bar of chocolate - as it was wartime I think it was my first ever bar of chocolate. Later in my grandparents home, which seemed to be always full of military people, a similar thing happened - I was spoiled. 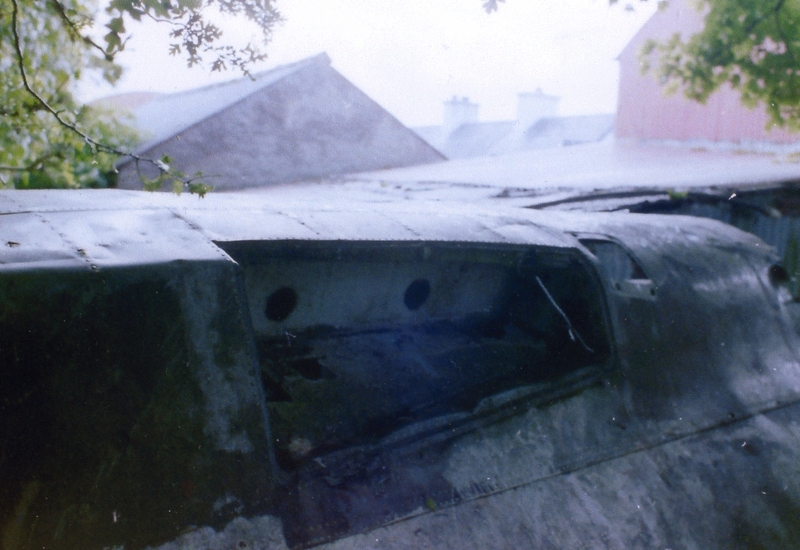 The Irish Military archives in Cahal Brugha Barracks in Dublin contain a file on this crash. The report is a collection of correspondences and official reports created by the military personnel who attended the crash and who helped in the rescue and co-ordinated the movement of injured between hospital and Northern Ireland, trying as best they could to maintain the requirements of neutrality. One summary report gives the impression gained by the local Irish Coast Watching Service Look Out Posts. These were small concrete shelters located on prominent headlands around coast and would normally be the first people to encounter an aircraft such as 42-31420. In statements made to their superiors after the event, Irish Army Lt.'s Melican and Bolger from Finner Camp reported that that they were among the first to reach the site. Local civilians had made it to the site before the Guards and Army. At the time that they reached the site around 21.30 hrs on December 9th, they met with Dr. Connolly and the police making their way up the mountain. Locals were at that time trying to release one of the airmen who was trapped and they refused to stop this work when the military asked them. As early as December 14th, Capt. J K Birthistle of the Armies Western Command G2 section filed the report which follows. Note that this officer was not a local to the area so his spelling of place names and understanding of the location comes across in this report. I have the honour to submit report re above crash. A Flying Fortress on delivery from America crashed at Eagle Rock, Ballaghnatrellick (1900 ft. approx.) at 16.15 hours on 9/12/43. She carried a crew of 10 of whom 2 were killed and 8 were injured, the Plane itself was wrecked. On arrival in Sligo at 22.30 hours on the 9/12/1943, I called at the Guards Barracks and received a message from the Duty Officer, Athlone to the effect that the dead and injured were to be transferred across the border in the R.A.F. Ambulances. Two of the injured were, at this time, in Sligo Co. Hospital. I called and saw Dr. McCarthy Surgeon who was working on the patients and informed him that the remainder of the injured crew would not be coming to the Hospital for treatment. I arrived at Ballaghnatrillick at 23.15 hours. Two R.A.F. Ambulances had arrived with personnel – 2 Doctors; 1 Nurse; 2 Drivers and 1 Officer – all in uniform. We organised a party and with a guide set up the mountain. From the point where the road ends to the scene of the crash is 4 1/2 to 5 miles and in that distance the mountain rises 1900ft, in some places it is almost vertical. From Ground level the mountain is in cloud and covered with freezing fog; visibility at any point is not more that a few yards; the entire going is bog, boulders and rocks. Time taken to ascend 4 hours and time taken to descend with casualty about 3 hours. I could not describe the hardship of the Stretcher parties in taking the injured men down the mountain. It is unbelievable that the could take a stretcher case down in safety, as near the top the mountain shelves away in 10 to 20 feet rises. Several members of the Stretcher Parties received small injuries such and cuts and bruises on legs and arms. Some older members had to fall out on the way down owing to exhaustion. It took at least 12 men to each stretcher and owing to lack of numbers it was extremely difficult to get stretcher parties. The last one of the injured was not down until about 07.15 hours 10/12/43 – 15 hours after the crash. As the injured had to remain in the freezing fog waiting for parties to carry them down, there were numerous requests from the Doctors at the top for stimulants, whiskey and hot-water bottles. I sent up 3 bottles of whiskey and about a dozen hot-water bottles – these never arrived at the top – some lost under way, the stretcher bearers coming down consumed some of the whiskey; as the ascent became too steep the hot-water bottles and blankets were abandoned. As the Stretcher Bearers were nearly all from Cliffony, about 4 ½ miles away, I arranged to have them driven home in an R.A.F. Ambulance as they were in a very exhausted condition and we purchased some liquid refreshment for them. It has been pointed out to Major Sprague – Air Attache at the American Legation – that splendid services were rendered by these men. We asked for a list of names so that these men might be shown some little appreciation. I have arranged with Supt. Fahy and Rev. Fr. Curran C.C. Cliffoney, who was at the spot, to furnish the list of names. I wish to mention the wonderful help given by the aged couple Mr. and Mrs. Rooney who live in the cottage at the foot of the mountain. Mr. Rooney aged 75 years left his sick bed to guide us beyond a dangerous river bed, before ascending the mountain. Mrs. Rooney remained up all night, supplied all the ambulances with boiling water for hot-water bottles and gave hot tea to each injured man and each stretcher party and supplied tea to the Military party. She refused to take payment and only asked that her reserve stock of tea about 1 ½ lbs be replaced if possible. My instructions that the dead and wounded would be brought to Northern Ireland were overruled by the medical Authorities who stated they must be brought to the nearest Hospital – Sligo. At about 5.30 on the 10th I made a second attempt to climb the mountain with 4 officers and 20 men. I arrived with 6 men at the plane about 05.00 hours, the remainder had got separated and lost in the fog. I had the two dead bodies taken down and handed them over to the R.A.F. returning to Northern Ireland about 12.30 hours together with certificates of Registration of deaths. On calling to the Co. Hospital, Sligo at about 15.00 hours I found a party of American Army Medical Service – number about 20 – all in uniform, about to take away six of the injured men, the condition of the remaining two men was so serious that it was not considered advisable to remove them. A further report to hand states that an American Ambulance returned Saturday evening and removed the remaining two men. The transport of Friday’s party consisted of 3 ambulances and a utility van. After the ambulances had departed some of the party in the utility van returned to the Royal Hotel where they had refreshments and food. Included in this party was Colonel Simpson, they were joined by Major Sprague, C/Supt. Leddy and Supt. Fahy. The Mr. Rooney mentioned in the text was Daniel Rooney, whose son Peter was active on the mountain that night. Much of the file in the archives deals with the aftermath of the crash and the circumstances surrounding the airmen’s kits and possessions carried on the aircraft. Due to the conditions on the mountain on the night of the crash, items of clothes and bedding found discarded on the mountain top were used to provide comfort to the injured men. These items then made there way down the mountains with the stretcher cases and were deposited at Sligo hospital. They were then taken to Northern Ireland with the returning RAF ambulances. Other items of clothing came to be used by the guard mounted on the wreckage in the days and nights following. 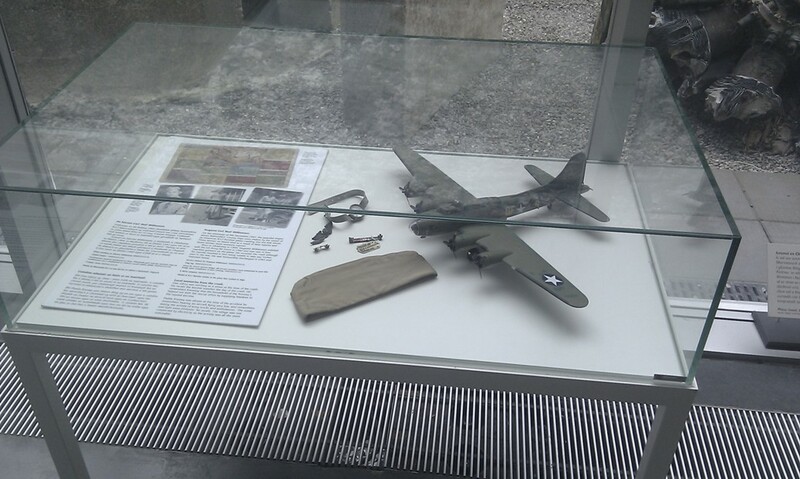 American officers visiting the site may have removed some items and the Irish Army finally carefully accounted for all personnel items as could be found in the days following as these were handed over to the American military. Some items were inevitably went missing with all the many visitors to the site and others were lost in the boggy ground. Troops providing assistance and guard duties came from the local Finner Camp Barracks and came from the 17th Infantry Battalion, 12th Cyclist Squadron and the 4th Field Artillery Regiment. An Irish Air Corps Salvage Team reached the area on December 11th and assisted in removing some of the loose equipment still with the aircraft. This was handed over to the American forces on December 18th. It is stated that the wreckage was blown up on site in the days after by the Army. This was normal practice to prevent the remains being mistaken for a new crash by overflying aircraft. That said, it is obvious from the amount of material that locals were able to take down the mountain that substantial remains of the aircraft were on the mountain. The four ladies listed above were members of the Ballyshannon Red Cross. On December 9, 1943, at about 1500 a B-17G airplane No. 42-31420 crashed on Trushmore Mountain, about five miles East of the village of CLIFFONEY, and 10 miles Northeast of the town of SLIGO, in County Sligo, Eire. 2nd Lt. WILLIAM F. WALLACE, 0-1573651, Navigator. 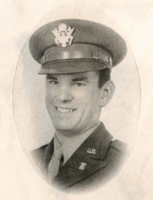 2nd Lt. RICHARD E. FOX, 0-685794, Bombardier. The following died of injuries on December 13. Sgt. ADAM J. LATECKI, 1514885, Air Gunner. 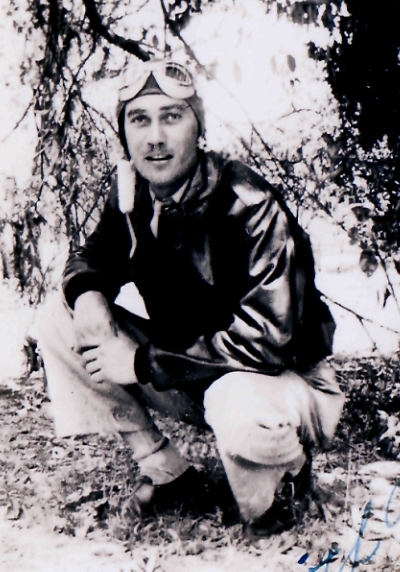 2nd Lt. RICHARD C. WALSH, 0-745025, Pilot, lacerations of face and scalp. 2nd. 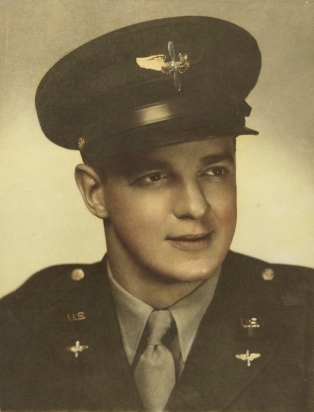 Lt. WILLIAM M. GRIM, 0-751123, Co-Pilot, fractured left arm, fractured jaw, fractured right elbow. S/Sgt MOSS L. MENDOZA, 11114403, Engineer, Fractured right femur, laceration, right wrist, frost bite left foot. S/Sgt ROBERT A. SMITH, 18192259, Radio Operator, fractured right Shoulder, fractured right mandible. Sgt. CARL W. WILLIAMSON, 18162726, Gunner, fractured transverse processes of lumbar vertebrae, fractured left leg. Bodies of the dead, the injured personnel and classified material and documents were taken to Northern Ireland during the day following the crash. Salvage of such removable equipment as can be brought off the almost inaccessible mountain peak is underway by arrangement with Eire Army authorities. The plane was one of 40 enroute from GOOSE BAY to points in Northern Ireland under Operations Orders No, 236, North Atlantic Wing, Air Transport Command, PRESQUE ISLE, Maine, dated 29 November, 1943. Lt. WALCH, the pilot, stated that shortly before the crash he had been in communication with NUTT'S CORNER, Northern Ireland, his destination, by radio, and at direction of the control officer there had altered his course seven degrees and was "homing" on NUTT'S CORNER, flying on instruments in the overcast. He believed his position to be several miles at sea. He stated his altimeter read 2600 feet. He stated no adjustment of the altimeter had been made to compensate for changes in temperature. The plane hit the very top of the mountain at an elevation of approximately 2100 feet. Lt. WALCH made his way down the mountain to a house, where he collapsed. The others of his crew were either trapped or so badly injured as to be unable to move. A local resident walked several miles to the Garda Siochana (National Police) station at CLIFFONEY and the first report of the crash was made there at 1840. From then on, all night, ensued one of the finest examples of unselfish community efforts that has come to the attention of this office. Local residents Of CLIFFONEY, and officials and organisations of SLIGO spent the entire night in getting the injured out of the wreckage, down off the mountain and to the SLIGO county hospital. One group spent hours literally digging earth with their hands to get at one man who was pinned beneath some of the wreckage. Members of the Irish Red Cross of SLIGO, aided by members of the LDF, made many trips up and down the several miles of steep, treacherous mountainside as stretcher-bearers, eight men being required to get each stretcher down. Outstanding was the service of a woman, Dr. Evelyn Connolly, of CLIFFONEY, the only physician in the district. She crawled on her hands and knees, and was pushed and pulled by two policemen, for three hours to reach the mountain top. U. S. Army medical officers state that her ministrations not only relieved the great suffering of the injured, but undoubtedly resulted in saving some of their lives. She remained in charge of the rescue work all night, lightly clad, in pouring rain and bitter cold. The last of the injured was not extricated and brought down from the mountain until morning. At SLIGO county hospital, excellent care and surgical treatment were given as fast as the injured arrived. Every physician in SLIGO was at the hospital all night. At the request of this office, medical personnel from 28th Station Hospital, U, S, Army, Northern Ireland, were dispatched to SLIGO on the morning of December 10, 1943. Officials of the Royal Ulster Constabulary and the Irish National Police cooperated to facilitate their passage of the border. Four medical officers, two nurses and several enlisted men, with three ambulances, were allowed to cross into neutral Eire to take over the injured. The Royal Air Force also sent over a medical officer and ambulance. Six of the injured survivors and the bodies of the two dead were evacuated to 28th Station Hospital on December 10, 1943, and the two others followed when it was determined they could be moved on the 11th. One of these, Sgt. Latecki, died on the 13th. Note: The aircraft serial is typed incorrectly in the book and I have yet to find a confirmation of the aircraft's name being Bella Donna, but it is thought that it might be that the author has taken this name from a theatrical production by John Kavanagh called “Bella Donna”. This play is based very loosely upon the story of the crash of 42-31420 in Sligo in December 1943. The play tells the story of interaction between the local hospital and the US military personnel. In reality, the injured men were not treated for long in Sligo before they were taken across the border into Northern Ireland. Michael Kennedy was also able to provide a copy of a letter from David Gray sent to Doctor Evelyn Connolly, Dispensary Doctor of Cliffoney. “You were the only medical officer in this area and without waiting to change into suitable clothing you set out with the first rescue party, in the cold and rain, up the formidable mountain. There were places were the ascent could only be made on hands and knees, where the men who accompanied you, had to drag you up steep rocks, but you never faltered. On arriving at the scene of the accident, you directed the removal of the dead and wounded, administered first surgical aid, assuaged pain, and materially contributed to the chance of survival in the case of several of the seriously wounded. Dr. P. Daly of Ballyshannon was also mentioned as having tended the wounded below the mountain and later assisted the doctors in Sligo hospital. The Gray referred to above was David Gray, the US representative in Ireland. Hathaway was Lt. Col. James L Hathaway, the US Military Attache in Dublin. McKenna was General Daniel McKenna the Chief of Staff of the Irish Defence Forces from 1940 to 1949. The family of Dr. Evelyn Flanaghan (nee Connolly) very kindly contacted me during this study and provided some background information and photos. Evelyn's first locum was the Arran Islands and then Cliffoney in County Sligo. She spoke often to her family of her experiences that night. They understand that she was offered a medal by the American Government but couldn’t accept due to Ireland being neutral. She did receive a cheque to compensate for her damaged clothing. The photo above was taken when Evelyn visited the crash site during the 1950’s or 1960’s with her husband Dermot, Tommy Connolly and local parish priest Canon Casey. Canon Casey is shown in the photo above with Evelyn. Her family recall that after the war one of those on board the crashed aircraft returned to Mullaghmore landing on the beach there. They all went to the local pub where he gave his hat to the innkeeper. Evelyn kept in touch with some of the survivors. Evelyn was an all round doctor, as her nearest hospital was 15 miles away she had to turn her hand to all parts. She was in fact doctor to Lord and Lady Mountbatten who owned the castle in Mullaghmore and visited every summer. She married Dermot Flanagan in early 1945 in Sligo. Evelyn’s neice and great nephew sent on these photos of her. 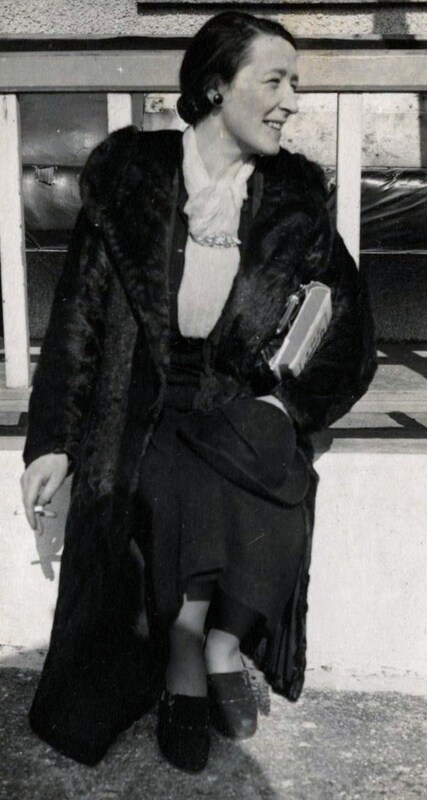 Evelyn later in life, above, dressed up. 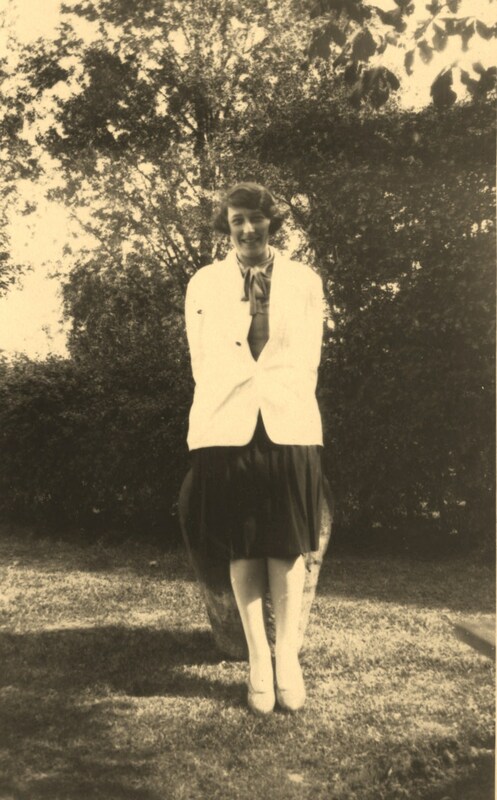 Evelyn as a student in the 1920’s. Note: For anyone planning of visiting the crash site, it is a steep walk, if there is a chance that visibility is poor, think ahead and plan your equipment and hiking abilities before going up as there are cliff edges in some places, mountain top lakes and bog holes as well as gullies. Take great care. And finally, very little remains of the wreckage, please try not to remove any more parts of the limited remains. The crash occurred on the western edge of the mountain or ridge shown as Teivebaun on modern Ordnance Survey Ireland maps. 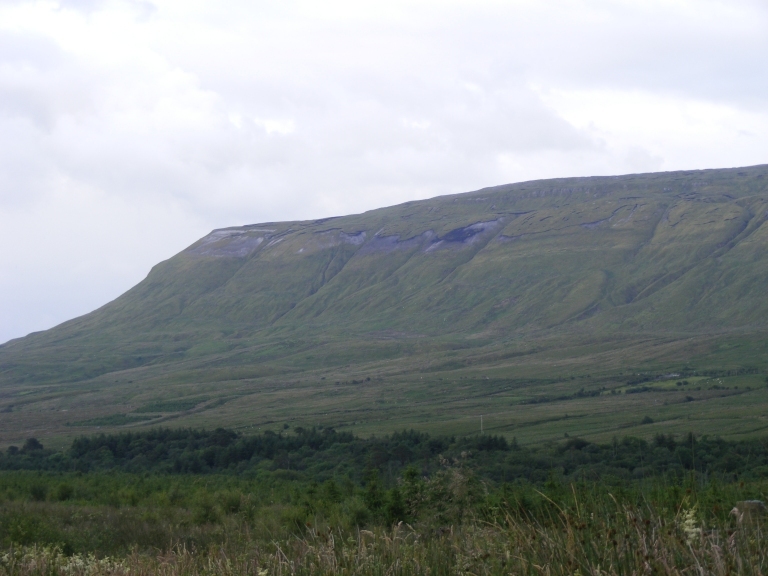 Mount Truskmore is the highest mountain in the Dartry Mountains and straddles the Country Sligo and Leitrim Borders. It is immediately to the east of the famous Benbulben mountain and is in an area of outstanding natural beauty. Running north of Mt. Truskmore is the further height of Tievebaun. Not far from the location of this crash, in March 1941, Catalina AM265, a flying boat of 240 Squadron, Royal Air Force, crashed killing eight airmen. 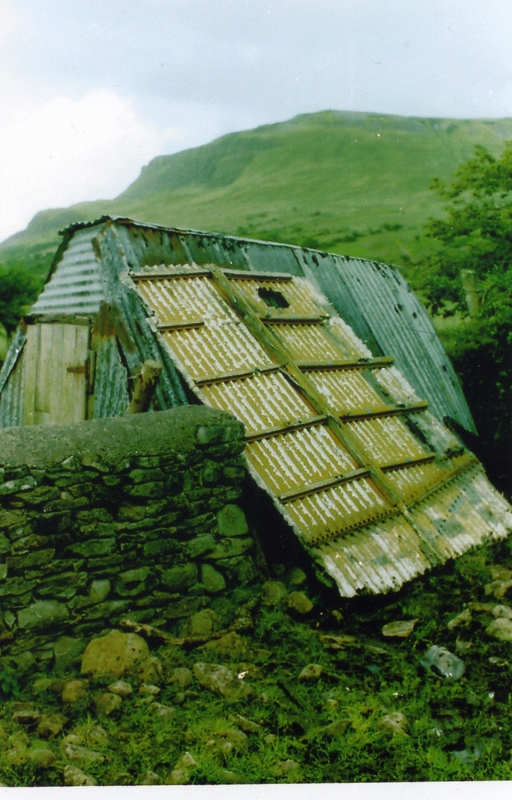 This incident occurred in County Leitrim on the eastern face of the mountain. 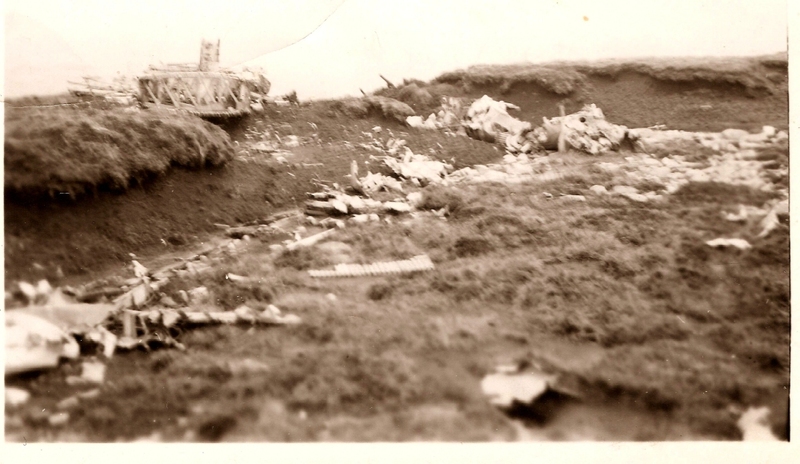 In the 1950's, local man Sean Gallagher sent the following images of the wreckage to crash survivor, Bob Smith. In 1962, the Irish national broadcasting company, Telefis Eireann built a television transmitter on the top of Mount Truskmore some distance from the crash site. A road was built up to the transmitter but even this is quite steep and a trying walk. The road is company property and not meant for public access. Furthermore, many of the local farmers are unhappy about hill walkers being in the area so access is officially difficult. In the mid 1990's when researchers Ronald Lee and John Quinn made trips, separately, to the site there were still engines and a large section of wing on the mountain. 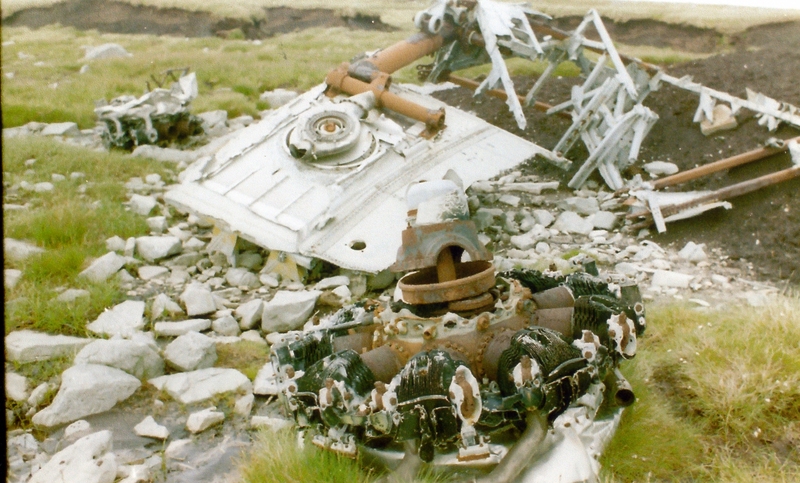 In 2005, the Irish Air Corps flew two of the engines off the mountain for use in the Irish Air Corps Museum. Other remains of the aircraft structure were left at the site at that time and are expected to still be there in 2009. I (Dennis Burke) did walk up the service road to the transmitter in May of 2008 but not having any reference information with me I was unable to find where the crash site was. In the 1990’s Mr. Ron Lee an aviation enthusiast made investigations about the crash and was able to talk to more of the local people at that time. He was also able to find numerous parts of the aircraft wreckage on local farms being used as gates and fences. The largest piece of wreckage to be found then was a section of the fuselage including the upper fairing for the radio compartment. It was the fuselage above the bomb bay area with part of the upper fuselage fairing and life raft stowage compartments. 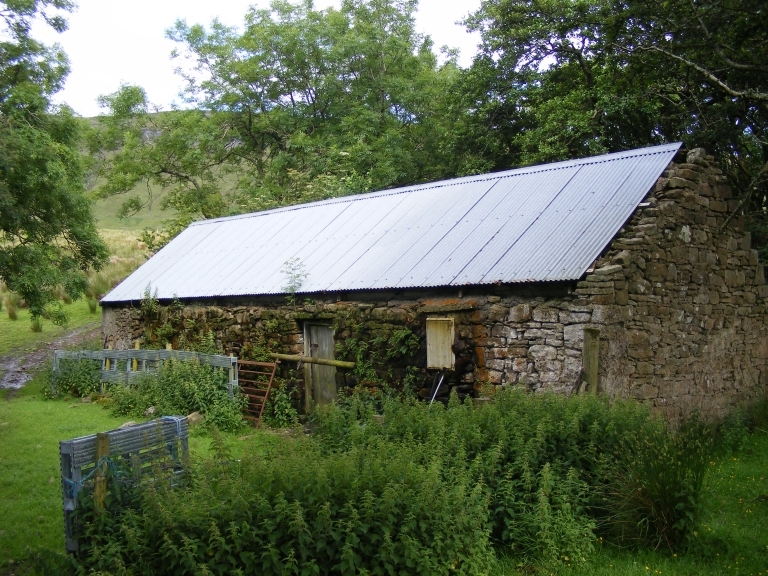 It had been bought down the mountain and was used as a chicken shed and later as a play area for the farmers grandchildren. 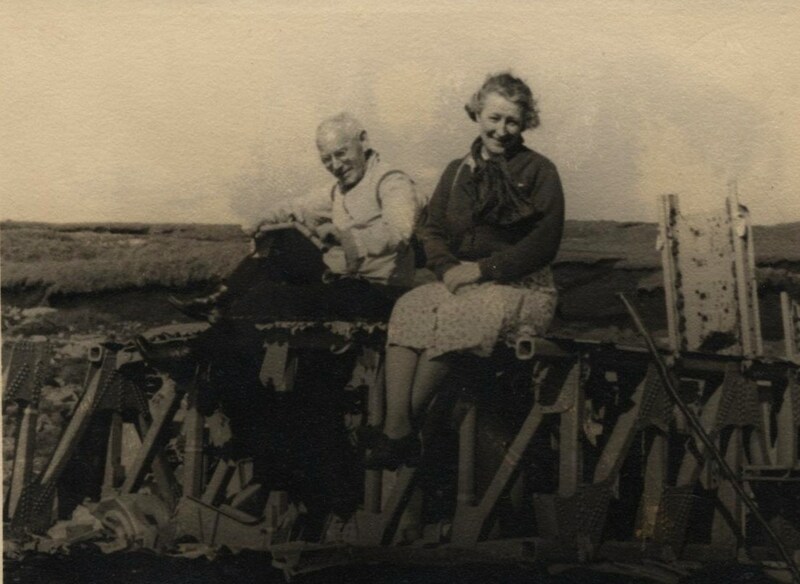 Local farmers recalled how they had gone to the wreckage and taken it apart for such uses. Speaking to locals during 2009 it seems that not much of these items still exist. 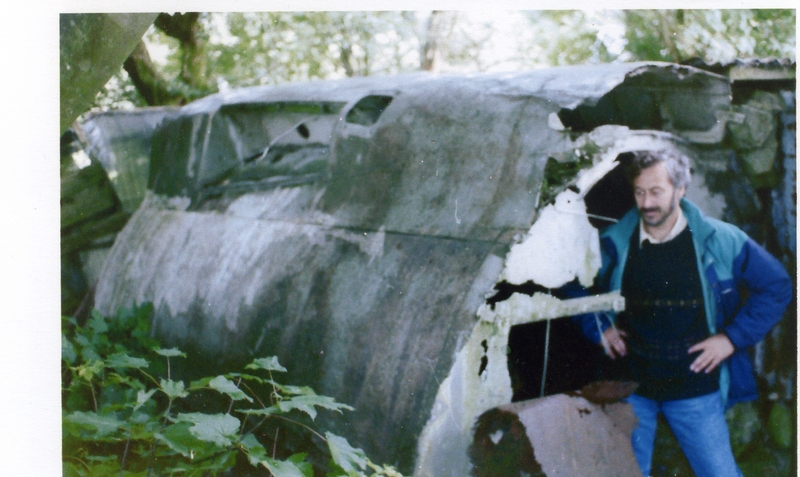 Ron Lee next to a shed built from a quarter section of fuselage. Visible is the liferaft stowage compartment along the top spine of the bomber (Photo: Ron Lee). 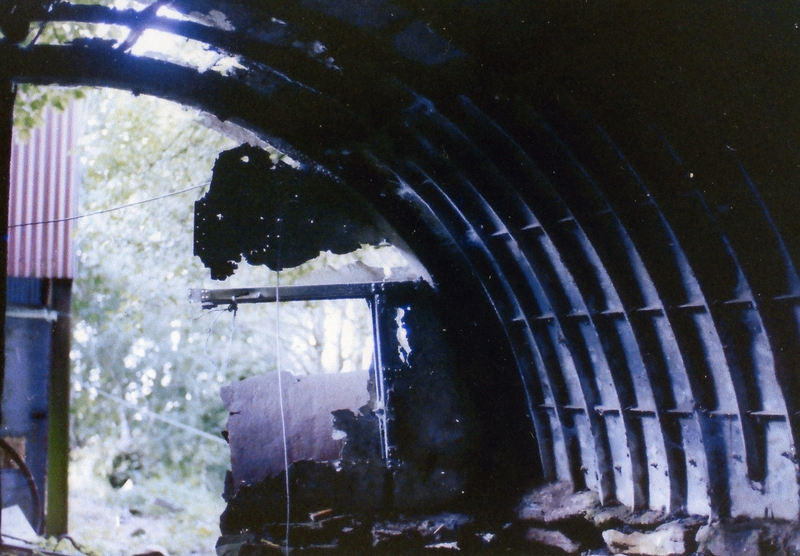 One of Ron Lee's photo's taken inside the bombers shell. A close up on the life raft stowage. Ron pictured at the wreckage in the 1990's, compared to the earlier 1950's or 1960's images above, the wreckage was diminishing over time. A large section of the aircraft forming a shed. 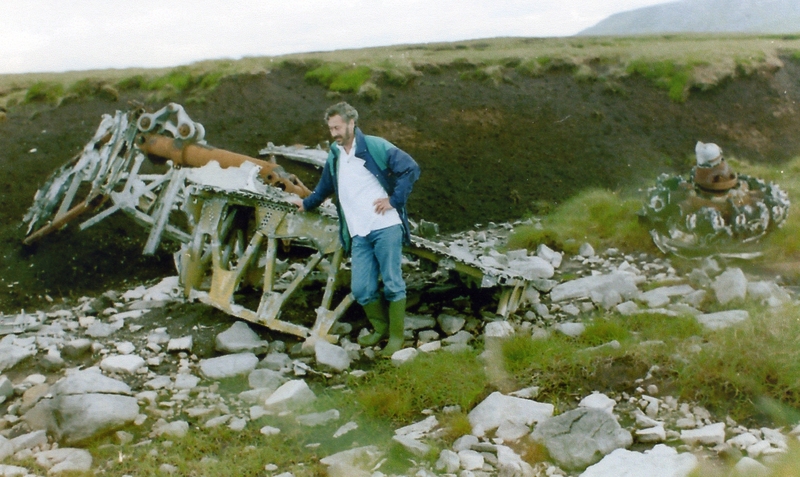 The wing wreckage and two of the engines that once lay on the mountain. The wreckage of the wing section. During 2009, I was kindly sent photos and descriptions of the way to the site by local Dave Rooney and Spanish walker, Michel Lozares. Finally, on a gloriously sunny day in June 2010, I managed to make my way up the mountain from the old entrance road to the Rooney’s cottage. Walking alongside one of the gullies with runs down the west side of Tievebaun as advised by Michel Lozares. The walk up was for me very tiring due to current fitness state but the top was reached after about one and half hours. The slope is rather steep and one has to lift oneself up all the way. The location of the wreckage is a little further north along the mountain, behind the cliffs visible from the valley floor. 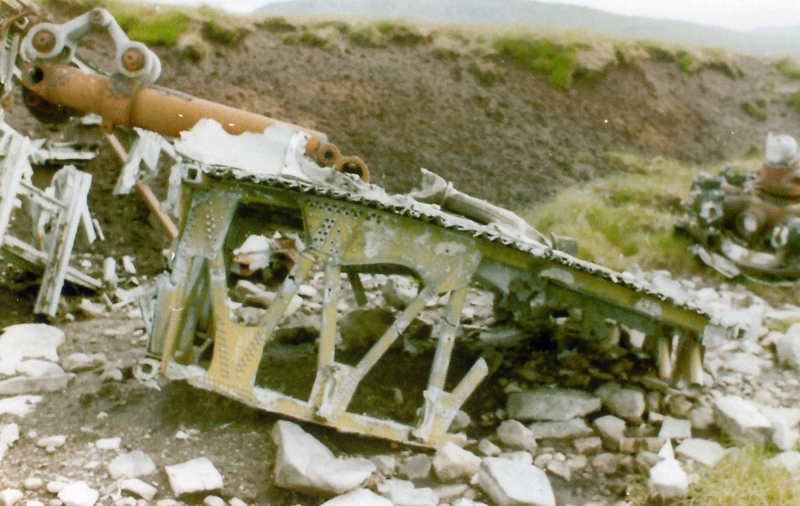 All that remains is the large wing section with landing gear leg attached, seen in most photos that were sent to me from the last 20 years. The other landing gear leg is also present along with two structural frame items. The ground area is strewn with little fragments of metal. Back along the gulley where it lies is what appears to be an engine firewall. Comparing my photos taken in 2010 with those from the 1950,s shows the amount of work that was put in to dismantle the remains of 42-31420. The wreckage that does remain carries the evidence of efforts taken to hack it up. Hopefully, these last few pieces can be left on the mountain in memory of the young men who flew her there in 1943. Having done this walk, it gave me a great appreciation for the toil undertaken by those who went up the mountain to help the injured. I had the pleasure of doing this on a sunny day after a good number of weeks of very fine weather. It should also be pointed out that locals would have farmed this area probably bound up and down this slope at will, and certainly their descendents would probably think nothing of having to go up during a days work. The image below from google maps gives an idea of the terrain in the area. The dark areas on the mountains indicate the areas of vertical or near vertical slopes in the area. The photograph above of Tievebaun from the western side of the Gleniff Horse Shoe road. The crash occurred above the dark smudge on the mountain. This composite image above shows the view North West out towards the Atlantic. The town of Mullaghmore is visible on the coast at center. The eastern slopes of Tievebaun are at mid right, including the area of the crash. 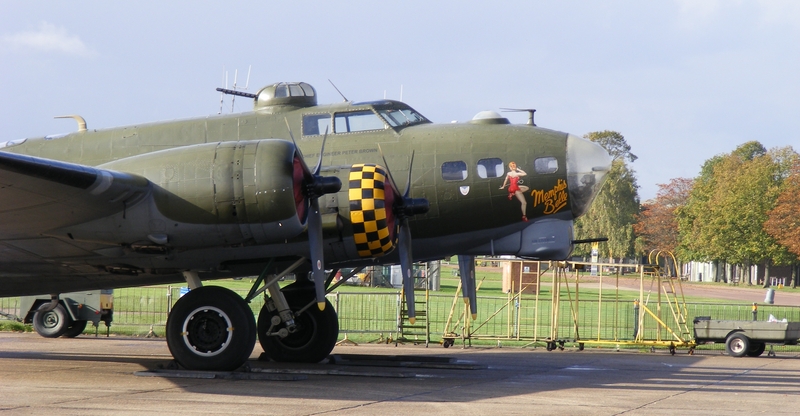 And to complete this report, a photo of a surviving B-17G aircraft which flies at air shows. This photo shows an aircraft similar to the layout of 42-31420. Particular differences would be the tail gun turret on 42-31420 would have been of an earlier design than on the aircraft below and the aircraft would have been unlikely to have carried any individual letters or unit markings. These would have been applied upon arrival in the England when it was assigned to an active bomber unit. The contemporary Flight magazine of 4th May 1944 carried a wonderful article on the B-17G as it was at that time a new variant. That article can be hear. Irish Military Archives, Dublin, US National Archives via M. Gleeson & M Kennedy. Correspondences with family of crew members. Correspondences with locals of the Ballintrillick area. Information from T Kearns, R. Lee, M. Lozares. Photos from T. Kearns, R. Lee, D. Rooney, M. Lozares. Sgt Adam J Latecki of Chicago, Illinois. Sgt Emil C Drake, born 1908 in Arkansas to Nannie Fletcher and Columbus Drake. His father was a soldier in the US Army before World War 1. 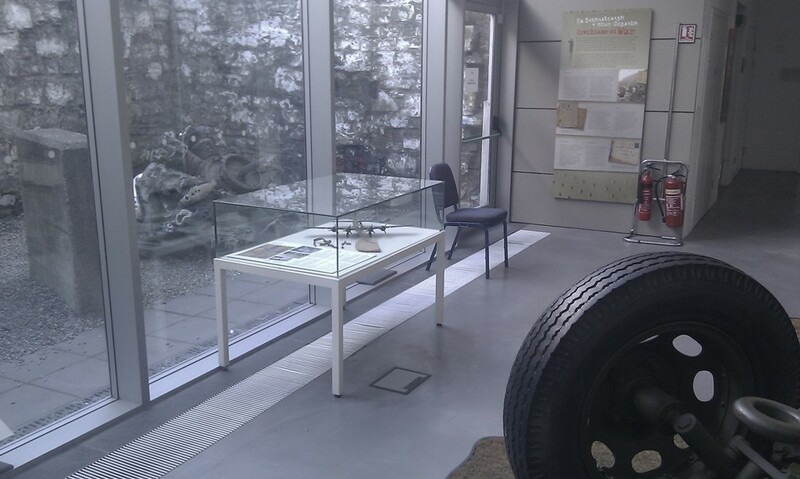 The national museum in Dublin in 2012, had one of the wrecked engines from 42-31420 on display in the Soldiers and Chieftains area of the Collins Barracks Museum. In 2011, they put on display beside it some items donated by Carl Williamson's family. These photos are taken on my mobile phone so excuse the quality.